The chapter devoted to "The English Family of Mayhew" (Vol. I, pp. 104-116) comprises all that was known by the author at the time of its compilation but several things of material importance have since been discovered to be added to its conclusions. During two recent visits to England the compiler found evidence of the residence of the Governor's ancestors in Tisbury as early as 1520 indicating settlement there at a probable earlier date. Thomas3 Mayhew, who is considered the grandfather of Gov. Thomas5 , was taxed for "goods", as of the Tithing of Tisbury, in 1540. (Sub. Roll 197/184.) In a deposition dated 30&SHY;31 Elizabeth (1589) this Thomas3 Mayhew deposed at the age of 80 years to events and persons known to him in that parish for the past 63 years and more. This places his birth in 1509, his knowledge of events back to 1517 and it is probable that he was born in Tisbury. THOMAS MAYHEW (Robert2, Simon1), third son of a Robert of Dinton, b. abt. 1509, called "yeoman", is the putative father of Matthew 4 of Tisbury and doubtless came to be a resident of the latter named parish through the marriage of his father Roberts 2 with Joan Bridmore of Tisbury. It is probable that he inherited her estate there while the eldest son and heir retained possession of the Mayhew property in Dinton. He was buried in 1590 at Tisbury. His wife Alice predeceased him in 1586. 10. ELIZABETH, bapt. 1 May 1589; m. JOHN GILBERT of Denny Sutton 18 Mch.1612. 11. JOHN, bapt. 17 Jan. 1591. 12. THOMAS, bapt. 1 Apr. 1593. 13. JOAN, bapt. 8 Feb. 1595&SHY;6. 14. ALICE, bapt. 16 Dec. 1598; m. THOMAS PALMER 17 June 1622. 15. KATHERINE, bapt. 15 Mch. 1599-1600. 16. EDWARD, bapt. 24 April 1602. 12. THOMAS MAYHEW (Matthew4), bapt. 1 Apr. 1593 at Tisbury, Eng., is the Governor, first of the name in this country, whose personal history has been sufficiently detailed in the two preceding volumes. The name of his first wife is not known nor has any clue to the date and place of the marriage been found. Neither is it known when or where she died. [Iris Gardner <iris.gardner@worldnet.att.net> writes, "1st wife of Thomas Paine Mayhew was Martha Parkhurst b. 1595, d. 1635. Their son was Thomas Mayhew Jr., who married Jane Gallion."] He m. (2) Mrs. JANE (Gallion? )* PAINE, wid. of Mr. Thomas Paine, a London merchant, abt. 1634 (Vol. II, p. 90, Annals of E.). [*The name Gallion, if it be correctly given, is very rare in England. Galland is found in Green's Norton where the Paines owned property, and Gallyon in Ramsey, Huntingdonshire.] She was living 15 May 1666, but died before her husband. In London the compiler found references to a Gallion family, to which she may have belonged, and he has many other English notes relative to the Mayhews which he hopes to follow up in the future. Some interesting additional facts have also been discovered by the compiler respecting the early life of Gov. Mayhew. It will be recalled (Vol. I, p. 114) that a contemporary writer states that the Governor was "a merchant bred in England, as I take it, at Southampton." "Nono die ffebr' 1620 (i.e. 1621) Thomas Mayhew late servant and apprntiee unto Richard Masey of the Towne and countie of Southampton mrcer havinge well and truely served his spprntiship with his said mr whoe beinge prsent testified to the same And he the said Thomas Mayhewe (desieringe to be admitted a free commoner of the said Towne to use his trade of a mrcer in this said Towne and his said mr likewise desieringe the same) was therefore this prsent daie admitted and sworren a free commoner accordingly." An interesting and important statement is therein found which recalls the statement of Thomas Macey of Nantucket (who is said to have emigrated from Chilmark, co. Wilts), that Governor Thomas Mayhew was his "honored cousin" (N. Y. Col. Mss., Vol. 25) and here is found documentary evidence that Thomas Mayhew was an apprentice of Richard Macey, a Southampton merchant. Richard Macey, his master, was a native of Chilmark and in his will of 20 Nov. 1633 he provided for his burial in that parish (Arch. Sarum X. 30). Undoubtededly further search would reveal the exact relationship of this Richard to Thomas Macey, the emigrant, and thus show the kinship between the families of Mayhew and Macey. 21. HANNAH, b.15 June 1635; m. (1) THOMAS DAGGETT (3); (2) SAMUEL SMITH. 23. MARY, b.14 Jan. 1639&SHY;40; Prob. d.y. 20. THOMAS MAYHEW , (Thomas,5 Matthew4), b. 1620&SHY;1 in England; came to N. E. in 1631 and res. at Medford and Watertown until his removal to the Vineyard in 1642. All the known details of his life have been related in previous volumes (I, pp. 127&SHY;30 et. seq.) and nothing further has since been discovered. He m. JANE, dau. of Thomas and Jane (Gallion?) PAINE, his step&SHY;mother's daughter, who was b. abt. 1625. He d. at sea in 1657 as previously related and his wid. m. (2) RICHARD SARSON. 33. JERUSHA, b. (1664); m. (I) Joseph WING 12 Apr. 1682; (2) THOMAS EATON of Shrewsbury, N. J. 41. PAINE, b. 31 Oct. 1677. 42. MARY, b. 25 May 1680; m. (l) Dr. THOMAS LITTLE; (2) JONATHAN BRYANT. 43. THOMAS, b. 5 May 1683. He was a "student of physicke" and res. in Plymouth. He d. 6 June 1707, unm. 50. ABIAH, b. (_____); m. WILLIAM TILTON (9). 51. SARAH, b. (_____); m. JOHN TILTON (10). 52. PEREZ, b. (_____); d. bef. 1715. 53. BATHSHEBA, b. (1680); m. JOSIAH TILTON (12). 60. EXPERIENCE, b. 5 Feb. 1673. 62. ELIZABETH, b. (1677); m. (1) JACOB CLIFFORD (30); (2) ICHABOD ALLEN (14). 63. BENJAMIN, b. 11 Sept. 1679. 64. DEBORAH, b. 1681; m. EBENEZER NORTON (54) 18 Nov. 1715. 65. RUTH, b. (_____); d.y. 66. RUHAMAH, b. 10 June 1685; d. 1781, unm. 67. SIMON, b. 25 July 1687. 71. MATTHEW, b. 1699; d. 1714. 72. ELIJAH, b. (_____); res. C., tailor; m. EUNICE NORTON (93) 11 June 1729 and had Anna, b. 1730 and Constant, b. 29 Nov. 1731. The father d. 20 Dec. 1734. 73. FORTUNATUS, b. (_____); res. E., mariner and pilot. He d. between 1756&SHY;8; prob. unm. 75. ANNA, b. 1710; m. WILLIAM BASSETT (36). 76. MARY, b. 1714; m. BERIAH TILTON (23) 12 Dec. 1728. 80. MARY, b.26 Sept.1700; m. JETHRO ATHEARN (18). 81. PAINE, b. 19 Jan. 1701&SHY;2. 82. MARTHA, b.20 Feb. 1705&SHY;6; m. SHUBAEL SMITH (337). 83. SARAH, b. 7 Aug. 1708; m. ABISHAI FOLGER 6 Nov.1727. 84. THOMAS, b. 23 April 1710. 85. BETHIAH, b. 31 Mch. 1712; m. (1) JACOB NORTON (71); (2) ISAAC CHASE (43). 86. HANNAH, b. 31 Mch. 1713&SHY;14; d.7 June 1715. 87. HANNAH, b. 12 Aug.1715; perh. m. BENJAMIN SEARLES. 88. MATTHEW, b. 15 May 1721. 90. SUSANNA, b. 5 Nov.1714; d. 28 Aug.1734 (bur. Ipswich). 91. LUCY, b. 4 July 1716; m. (1) Dr. THOMAS LITTLE (30) 13 Nov. 1733; (2) JOSEPH EATON. 92. ELIZABETH, b. 1718; m. Rev. BELLAMY BOSWORTH of Bristol, R. I.15 Aug. 1745. 96. THOMAS, b. 1725; d.1745. 97. ANNA, bapt. 1727; m. JOHN ALLEN (74). 98. MARTHA, bapt. 1729; m. (1) SYLVANUS PARKER of Falmouth; (2) Dr. THOMAS SMITH of Falmouth. 100. ABIAH, b. 3 Mch.1711&SHY;12; m. BENJAMIN ALLEN (52). 101. ADONIJAH, b. 18 Oct.1713; d. 19 Mch.1713&SHY;14. 102. ZEPHANIAH, b. 28 June 1715. 103. JERUSHA, b.5 Apr. 1717; d.1793, unm. 104. JEDIDAH, b.18 Apr. 1719; m. URIAH TILTON (42). 105. MARY, b. 3 Apr. 1721 ; m. THOMAS JENNEY. 106. BETHIAH, b. 20 May 1723; d.y. 107. MERCY, b. 22 July 1725; m. ABEL CHASE (80). 110. RELIANCE, b. 1696; m. ELIASHIB ADAMS (34). 111. SAMUEL, b. 1700; d. 25 July 1746. 114. NATHAN, b. 8 Oct. 1712; d. 14 Oct. 1733; grad. H. C.1731. 115. ABIGAIL, b. 6 May 1714; m. (1) JONATHAN ALLEN (25) 1733; (2) WILSON MARCH 1748. 116. EUNICE, b. 4 Apr. 1716; m. MOSES BELCHER (12) of Braintree. 117. ZACHARIAH, bapt. 14 May 1718. 118. JONATHAN, b. 8 Oct. 1720. 121. THEOPHIDUS, b.1703 ; d. 25 April 1752 ; he m. (1) HANNAH FREEMAN Of Harwich 27 Nov.1742 at Boston; (2) SARAH TILTON (34) MAYHEW, wid. of Benjamin (134) by whom he had one child, Theophilus, b. 1752 (posthumous). 123. MEHITABLE, b.1707; d. 27 Mch. 1792, unm. 124. KEZIAH, b. Mch. 1708 ; m. (1) DANIEL BUTLER (607); (2) THOMAS ALLEN (54). 125. LYDIA, b. (1710) ; m. SAMUEL SMITH (62). 126. LOIS, b. (1712); m. SAMUEL HUNT (55). 128. ZILPHA, b.30 Mch. 1718; m. JOSEPH TILTON (33). 130. JEMIMA, b.19 June 1707; m. THOMAS TILTON (31). 131. BATHSHEBA, b.11 June 1709; m. BENJAMIN LAMBERT (20). 132. HANNAH, b.14 Oct. 1711; m. SAMUEL TILTON (35). 133. RUTH, b. 29 July 1714; m. JOSEPH TILTON (33). 134. BENJAMIN, b. 21 May 1717. 140. JOSEPH, b. 26 Feb. 1709&SHY;10; d. 31 Mch. 1782, unm. He grad. at H. C. 1730 in the class with Chief Justice Peter Oliver and Hon. Stephen Minot. He was a leader of the patriots in the Revolutionary period. 141. TIMOTHY, b. 25 June 1711. 142. SAMUEL b. 10 Mch. 1712&SHY;13. 143. JANE, b. (_____); m. JOHN BASSETT (38). 144. SIMON, b. 16 Mch 1716; d.y. 145&SHY;146. Two children; d. in infancy. 147. SIMON, b. 20 Oct. 1719. 148. RUTH, b. 26 Dec. 1721; d. 17 Dec. 1815; Unm. 150. MATTHEW, b. 6 July 1723. 151. ELIJAH, b. (1725), prob. rem. to Newbury, Mass. and m. EUNICE SARGENT of Gloueester, Mass. 14 June 1761. His son, Capt. Elijah Mayhew, Jr. m. SARAH GALLISHAM 23 July 1786 and d. at sea Dec. 1800, leaving three children. 160. MARY, b. 22 Apr. 1742; d. 1812, unm. 161. THOMAS, b. 9 Sept. 1744. 162. ANNA, b. 11 Dec. 1746; m. JOHN THOMAS, Jr., 1773. 163. ELIZABETH, b. 13 Feb. 1748; m. CHRISTOPHER MINOT. 164. WILLIAM, b. 28 Nov. 1751; d. 1752. 165. SARAH, b. 18 Jan. 1753; m. Capt. THOMAS NICHOLSON. 166. WILLIAM, b. 1 Aug. 1755; d.s.p. 167. BETTY, b.5 Mar. 1757. 168. LUCY, b. 30 July 1760; d.y. 190. ELIZABETH, b.27 Nov.1725; m. JOSIAH TILTON (43). 191. REBECCA, b.27 May 1730; m MAYHEW ADAMS (40). 200. JEDIDAH, b.3 Mch. 1733; m. SAMUEL CHASE (100). 201. PAINE, b.16 Mch. 1734. 202. SARAH, b.18 Nov.1735; m. THOMAS LOTHROP (71). 203. ELEANOR, b.8 Dec. 1746. 204. THOMAS, b.24 Mch. 1750 (no further record). 210. ABIJAH, b. 5 Apr. 1746; d. unm. 211. MARGARET, b. 9 Dec. 1747; m. (1) WILLIAM MAYHEW (251); (2) JEREMIAH MAYHEW (298). 212. MARY, b. 31 Mch. 1750; m. JOHN ALLEN (212). 213. MARTHA, b. 8 Sept. 1752; d. 1775, unm. 214. ELIZABETH, b. 30 June 1754; m. MARSHALL JENKINS (123). 215. MATTHEW, b. 1 Aug. 1756. 216. SARAH, b. 9 Dec. 1758; m. JONATHAN WORTH (63). 217. PARNELL, b. 23 May 1761; m. JONATHAN MAYHEW (253). 218. PRUDENCE, b.12 Apr. 1764; m. ZEBULON ALLEN (273). 219. ALLEN, b.18 June 1767. 220. CLARISSA, b. 8 Dec. 1770; m. TRISTRAM ALLEN (233). 221. REBECCA, b. 13 July 1774. 230. SUSANNA, b. 21 June 1751; m. JETHRO ALLEN (192). 231. LUCY, b. 25 Apr. 1753; m. WILLIAM MAYHEW (351). 232. ELIZABETH, b. 9 Apr. 1755; m. LEMUEL JENKINS (121). 233. THOMAS WADE, b. 14 Mch. 1757. 234. ZACCHEUS, b. 19 Feb. 1759. 235. NATHANIEL, b. 16 Apr. 1761. 236. REBECCA, b.15 Aug. 1763; m. RUFUS DAVIS (126). 237. OLIVE, b. 1 Mch. 1766; m. DAVID DAVIS (122). 240. ADONIJAH, b. 20 July 1736; no further record. 241. ZEPHANIAH, b. I9 Nov.1737; d.y. (1749). 242. LUCINDA, b. 16 Feb. 1738-9; m. CORNELIUS DUNHAM (183). 244. WADSWORTH, b. 27 Apr. 1741. 245. JERUSHA, b. 13 Dec. 1743. 246. ZEPHANIAH, b. 9 Feb. 1745. 247. THOMAS, b. 2 Mch. 1749. 250. NATHAN, b. 18 May 1741. 251. WILLIAM, b. 7 July 1746. 252. ELIZABETH, b. 30 Jan. 1749; m. SAMUEL NORTON (160). 253. JONATHAN, b. 7 Jan. 1755. 254. ZACHARIAH, b. 28 Aug. 1757. 255. REBECCA, b. Dec. 1765; d.13 May 1886, umn. 118. JONATHAN MAYHEW , (Experience,8 John,7 Thomas,6-5 Matthew4), b. 8 Oct. 1720; res. C.; rem. to Boston, clergyman. This celebrated divine was without question the most brilliant man of Vineyard origin, who left his native Island to become, in the metropolis of N. E., one of the foremost figures in the social, religious and political circles of pre&SHY;Revolutionary times. He was not only this, but no less a personage than President John Adams called him "the transcendent genius" of his day and his fame will endure and become more permanent as time goes on. Of his early life on the Vineyard, in his native town of Chilmark, little is known, but it is said that his father intended him for a business career, having in view his own lean income after a long life spent in the ministry. This plan, however, did not materialize for the young man, showing studious habits early, with marked intellectual traits, and developing a religious temperament as he grew older, his father determined to send him to H. C. to follow in the footsteps of his older brother Nathan, who had been trained for the ministry, but had died only two years after graduation. [*It is said that the Rev. Experience sold some of his real estate to raise the money to furnish this collegiate course to the youngest son. It is prob. that Jonathan taught school between times to help defray his expenses.] While in college, according to one of this leters to his father when he was visiting in York, Me., during a religious revival, he expressed in decided language his disapproval of the extravagancies and fanaticism of the affair, an early indication of the independent tendencies of his mind. Indeed he had inherited the germs of liberality from his father, who had frequently engaged in theological controversies with the great preachers of his generation. After graduation in 1744, it is probable that he was engaged in tutoring at college until June 1747, when he accepted a call to become pastor of the West Church in Boston. His preaching and public speaking before this had been so broad in spirit, and so unconventional that he wrote to his father: "the clergy of the town stand aloof from me and I have to study hard." When he was ordained every clergyman in the city either refused to attend or found excuses to be absent from this important church function and only pastors from the country churches took part in the ceremony. His aged father gave the "charge" to the newly made minister. This treatment, due solely to his alleged unsoundness in theological dogmas even extended to personal relations, such was the bigotry of the day, and many of his city colleagues tried to ostracise him socially. He was also without membership in the Boston Association of Congregational Ministers because of his heterodoxy, but all this had no effect upon his standing in the community nor with the people of his parish who saw in the brilliant young preacher one of the notable intellects of the Boston pulpit. He was indeed pre&SHY;eminently the pioneer of liberal religious thought in New England and the founder of that division of the old Puritan church now classed as Unitarian and Universalists and which found early expression in the pulpit of the West Church through him and his several successors. [*He was the first clergyman in New England to openly and definitely oppose the scholastic dogma of the Trinity as well as to deny the "five points" of Calvinism. This not only took great moral courage but it required great forensic and disputative knowledge to maintain his position as he had pitted against him the brightest intellects of that period which had been called the golden era of ministerial influence in New England.] Nor did he limit the activities of his mind to religious teachings alone, but he entered into the public discussions of the problems of the day with even more zeal and directness than would be tolerated in the pulpit. The Colonies were then beginning to show their teeth to the British ministry and preparing to resist peacefully every continuance of tyrannical government, and to continue resistance by force if necessary. As early as 1750 he published a remarkable "Discourse on Charles the First and the Doctrine of Passive Obedience and Non Resistance". This sermon or essay was received in England with general approval by the clergy and people not connected with the established church or the Court and its doctrines laid the foundation for further resistance of our people to ministerial oppression in the Colonies. President Adams said of him: "Dr. Mayhew seemed to be raised up to revive all the animosity of the people against tyranny within Church and State and at the same time to destroy their bigotry, fanaticism and inconsistencies. This transcendent genius," he continues, "threw all the weight of his great fame into the scale of his country." Other public discourses were published in succeeding years, but his sermons regularly delivered at the weekly services were full of his reflections on the social and political tendencies of the times and kept alive the revolutionary spirit of the people. In 1763 he published his "Observations on the Conduct of the Society for Propagating the Gospel", a savage attack on the managers for what he believed to be their plan to divert the revenues of the Society from its original object to that of establishing bishoprics and a State Church in New England. Like its predecessor it created a profound impression and provoked bitter rejoinders. His published sermons had attracted such favorable notice in England among the clergy that he was given the honorary degree of Doctor of Divinity by the University of Aberdeen, Scotland, when he was but thirty years old, while his political addresses and published discourses gained the applause of the liberal statesmen of the Whig party of Great Britain and he kept up until his death a continued correspondence with both the leading clergymen and notable politicians of the mother country. Among the latter was Thomas Hollis, the wealthy and munificent merchant of London. In 1766, he published his "Discourse on the Repeal of the Stamp Act", which gained the approval of the great Whig minister, William Pitt, to whom it was dedicated, and this proved to be his last contribution to the burning questions of the times. Although tradition has brought down to us, and it is confirmed by the pencil of the artist, that he was a man of handsome and distinguished appearance, yet it appears he was either inherently not vigorous of body or that his activities in parish work and public speaking had undermined his constitution. After a journey to Vermont in June 1766 to attend a parish council, he returned to Boston exhausted and took to his bed, never again to rise. At the early age of 45 years and 9 months he died on July 8, 1766 "of a nervous fever, overplied by public energies", as stated in the legend beneath his portrait. The loss to his parish and to the community was marked by profound sorrow. Numerous "elegies" remain in print to mark the esteem of private and public friends in all walks of life both at home and abroad. He will be remembered as the great pulpit orator and patriot of his time who but a month before his death proposed a "communion of the Colonies" along the same line as that of "communion of the churches", (Letter to Hollis.). Robert Treat Paine, signer of the Declaration of Independence, said "he was the father of civil and religious liberty in Massachusetts and New England." He married one of the most beautiful belles of her time. ELIZABETH CLARKE, dau. of Dr. John and Elizabeth (Breame) Clarke of Boston, a wealthy physician who lived in a famous mansion at the north end of Boston known as the Mayo&SHY;Clarke house. She was b. in 1733 and their marriage took place 2 Sept. 1756. She is described as not only beautiful in person but possessed of a character as attractive with all the desirable and lovable womanly attributes, and as the wife of the most popular clergyman of his time, she rivalled him in the admiration of his parishioners and other friends. Their portraits painted by the celebrated artist Copley, which were unfortunately destroyed in the great fire of Boston in 1872, bore out the contemporaneous opinions of the times as to the great beauty of the wife and the handsome features of the husband. The engraved portrait of Rev. Jonathan Mayhew which is the frontispiece of Vol. II of this work bears testimony to this general tradition of his clear&SHY;cut classic face. It was engraved in 1767, after his death, from the Copley portrait by the Italian artist Cipriani in folio size 10 x 13 inches at the request and expense of Thomas Hollis, Esq. of London, the well&SHY;known benefactor of Harvard College. Although in his life he had preached powerful sermons against the establishment of bishops, it is one of the strange evolutions in family history that his grandson became one of the noted bishops of the American Church, the Rev. Dr. Jonathan Mayhew Wainwright of the diocese of New York. Through this line have been descended a posterity distinguished alike in the military, naval, political and social life of the nation. After the death of Rev. Jonathan Mayhew, the beautiful young widow remained unmarried for eight years although the recipient of constant and importunate tenders of proposal of marriage from numerous admirers. She finally accepted and married 3 Dec. 1771 the Rev. SIMEON HOWARD of Boston, Mayhew's successor in the pastorate of the West Church, who is described as the personal and temperamental antithesis of the famous pulpit orator who preceded him. She did not long survive, however, and d. in April 1777 at the early age of 44 years. The Rev. Jonathan Mayhew left two surviving children, both daughters, one of them dying in infancy shortly after her father and the line ceased for want of male issue. Inventory of his estate returned 27 July 1769 shows property valued at £323&SHY;17&SHY;5. 260. ELIZABETH, b. 1759; m. PETER WAINWRIGHT of Boston 5 June 1790. She d. 5 July 1829 at Liverpool, England. Descendants continue to this day to perpetuate the name of Jonathan Mayhew in each generation. 270. MALATIAH, b. 24 Sept. 1731 (living 1762), but not mentioned in his father's will). 271. MARY, b. 22 May 1734; m. _____ WOODWORTH. 272. JOHN, b. 7 Mch. 1736; no further record. 273. LYDIA, b. 9 June 1741; m. WILLIAM RUSSELL. 274. RUTH DAVIS, b. 17 May 1746-7; m. TIMOTHY MAYHEW (315). 290. RUHAMAH, b. 29 Dec. 1728; m. WILLIAM STEWART (38). 291. HILYARD, b. 1731; d. 18 Dec. 1738. 292. THANKFUL, b. (1733); m. _____ PITTS. 293. SUSANNA, b. (1736); m. SILAS HILLMAN (45). 294. NATHAN, b. 1739; d. 1760, unm. 295. SETH, b. 15 April 1740. 298. DEBORAH, b. (1746); m. EPHRAIM MAYHEW (301). 300. BENJAMIN, b. 27 April 1744. 302. HANNAH, b. 15 April 1748; m. ELIJAH SMITH (93). 310. RELIANCE, b. 9 Feb. 1732; m. BENJAMIN HATCH 1762. 311. RACHEL, b. 5 Jan. 1734; d. 1828, unm. 312. HANNAH, b. 22 Feb. 1736; d. 1827 unm. 313. BATHSHEBA, b. 10 Dec. 1737; m. WILLIAM TILTON (50). 314. JOSIAH, b. 5 Oct. 1740; m. REBECCA SKIFF (113) 21 Oct. 1779 and had Bathshebah, b. 1781 and Rebecca 1784, both of whom d.y. 315. TIMOTHY, b. 20 May 1743. 316. ABIAH, b. 18 Sept. 1745; m. DANIEL NORTON (455). 317. MARK, b. 10 Sept. 1747; d. 1814, unm. 319. ABNER, b. 15 Jan. 1750. } twins. 320. RUHAMAH, b. 21 Mch. 1754; d. 1899, unm. 142. SAMUEL MAYHEW , (Simon,8 John,7 Thomas,6-5 Matthew4), b. 10 Mch. 1712&SHY;13; res. C., farmer. He m. LOIS NORTON (97) 27 Dec. 1739, who was b. 1719 and d. 8 May 1802. He d. 8 April 1800 and his will 20 Sept. 1791 was pro. 31 May 1800. 330. JETHRO, b. 1741; d. 16 Oct. 1806, umn. 331. SAMUEL., b. (1743); m. PERSIS MAYHEW (343) and rem. to Readfield, Me. Had two children, Abiah and Nancy. 332. EUNICE, b. (1745); d. unm. 333. LOIS, b. (1747); d. unm. 334. RUTH, b. (1719); m. THOMAS HILLMAN (71). 335. JOHN, b. June 1752. 340. JANE, b. 2 Feb. 1749&SHY;50; d. 1768. 341. MATILDA, b. 22 Aug. 1751; m. ELIJAH SMITH (93). 342. SIMON, b. 15 Nov. 1753; m. MATILDA VINCENT (131) 1796 and d. 31 Mch.1847. No children. 343. PERSIS, b. 6 Oct. 1755; m. SAMUEL MAYHEW (331). 344. ANNA, b. 24 Mch. 1760; d. 8 Mch. 1813, unm. 345. OLIVER, b. 7 June 1763; m. JANE STEWART (130) 26 May 1791 and d. 25 Aug. 1828. She was b. 7 Apr. 1761 and d. 7 Jan. 1833. No children. 346. JANE, b. 28 Aug. 1768. 351. WILLIAM, b. 30 Oct. 1748. 352. SARAH, b.7 Oct.1750; m. (1) HOMES WASS (47) and (2) JONATHAN PEASE (317). 353. PHEBE, b.8 Aug. 1752; d. 1 Oct.1773. 354. REBECCA, b. 8 Aug. 1752 (twin with above). 355. JONATHAN, b. 13 Oct. 1754; d.y. 356. MARY, b. 3 May 1756; m. (1) JOHN SPRAGUE (35); (2) JOHN FERGUSON (30) She d. 20 Apr. 1851 in C.
357. THOMAS, b. 16 Jan. 1759; d.y. 358. ANNA, b. 20 Mch. 1761; m. JOHN PEASE. 359. PUELLA, b.15 Dec. 1763; m. (1) SAMUEL KELLEY and (2) PETER WALDRON. 360. MATTHEW, b. 12 Feb. 1766. 361. THOMAS, b. 1 Jan. 1769. 362. ELIZABETH, b. Feb. 1771; m. THOMAS COOKE (23). I. William, b. 27 Sept. 1784; d. 10 April 1860. II. Homes, b. 22 July 1787; d. 5 Sept. 1863. III. Anson, b. 2 Sept. 1793; d. 16 Aug. 1832, unm. IV. George, b. 29 Aug. 1796. V. John, b. 22 Aug. 1798; d. 25 July 1829. 381. CONSTANT, b. 17 Oct. 1759; d. 7 Dec. 1827; res. Williamsburg, Mass. Rev. soldier 1778; m. ROWENA _____. 382. WILLIAM, b. 13 Jan. 1761 ; m. SUSANNA STRONG. 383. WILMOT, b. 1l Aug. 1762. I. Constant, b. 15 Apr. 1790. II. Martha, b. 16 July 1793; m. Hon. LEAVITT THAXTER of E. Nov.1816. 385. LOTHROP, b. 31 July 1765; res. Williamsburg; m. ELIZABETH GILSON (?). 386. THOMAS, b. 12 Nov.1767 (twin with 387). 387. LYDIA, b. 12 Nov.1767; m. SHUBAEL HILLMAN (124). 388. FREELOVE, b. 29 Nov.1769. 389. PEGGY, b. 30 Jan. 1772. 400. JULIUS STEWART, b. 17 Feb. 1778; m. (1) JULIA ANN BATES and (2) ISABELLA H. NYE. 401. MARY, b. 22 Jan. 1780; m. EPHRAIM POOLE. 402. SUSANNA, b. 7 Nov. 1782; d. 13 Aug. 1837, unm. 403. MATTHEW, b. 29 Dec. 1784; m. SARAH LE BARON 14 July 1816. 404. REBECCA, b. 13 Feb. 1786; m. JOHN ROGERS. 405. MARGARET, b. 1788; m. THOMAS NICKERSON. 406. MARTHA, b. 1788; m. ALLEN DEXTER. 407. HARRISON PAINE, b. 20 Sept. 1794; m. SUSAN MAYHEW. 408. PRUDENCE, b._____; m. BENJAMIN BASSETT (183). 410. THEODORE G., b. 4 Jan. 1797; m. (l) ELIZA ROSS, and (2) AMANDA VINCENT. 411. CAROLINE, b. 4 Sept. 1800; m. WILLIAM MAYHEW. 420. THOMAS WADE, b. 14 April 1783; m. LUCY ALLEN, 23 Dce. 1810 and descendants reside in Ohio. 421. PARNELL, b. 23 Sept. 1785; m. WILLIAM MAYHEW (351). 422. HARRIET, b. 23 Apr. 1787. 423. MARTHA, b. 7 May 1789. 424. LEMUEL, b. 23 May 1791 ; m. SOPHRONIA CLARK. 425. ELIZABETH, b. 8 Jan. 1793; m. ALLEN LOOK (222). 426. MOSES ADAMS, b. 23 Dec. 1795. 430. ELIZABETH, b. 1787; m. WINTHROP BUTLER (479) 27 Jan. 1807. 431. ZACCHEUS, b. (1791); m. SARAH THAYER 18 July 1816. 432. PAMELIA, b. (1793); m. JOHN WEBBER 25 Dec. 1818. 433. EBENEZER, b. 17 Aug. 1795; m. LUCY FOLSOM. 434. JANE, b. (1797); m. JEREMIAH WEBBER. 435. LUCY, b. (1800); m. ALEXANDER JONES. 436. SUSAN, b. Oct. 1802; m. (1) JONATHAN CHAPMAN; (2) JOHN GAMMELL. 437. NATHANIEL, b. 22 July 1805; m. JANE W. PARTRIDGE. 438. SARAH, b. (1807); m. HARTLEY CUNNINGHAM. 440. NATHANIEL, b. (1787); m. NANCY ALLEN (262). No issue. 443. REBECCA, b. 13 APr. 1792; m. WILLIAM JERNEGAN (33) 26 Nov. 1812. 447. ALEXANDER, b. 14 Mch. 1799; m. REBECCA HILLS. 460. ELIZABETH, b. 4 Oct. 1776; d. 7 Sept. 1798 Unm. 461. WADSWORTH, b. 19 Jan. 1778; m. ANN COOPER. 462. JOHN, b. 29 Sept. 1779. 463. ADONIJAH, b. 19 Mch. 1781; m. SARAH COOPER. 464. WILLIAM, b. 1 June 1783. 465. CHRISTIANA, b. 24 May 1785; m. REUBEN WELLS. 466. DAVID, b. 9 Aug. 1787; d. Unm. 467. SARAH, b. 31 Oct. 1789. 468. LUCINDA, b. 14 Dec. 1792; d.y. 469. ABIGAIL, b. 10 July 1795; d. 1842 Unm. 470. BENJAMIN, b. 29 Oct. 1797; d. Unm. 471. ABIAH WADSWORTH, b. 15 Sept. 1774; m. JOANNA LOCKE 17 July 1795; res. Spencertown, N.Y.; had issue six children. 472. JERUSHA, b. (_____); m. (_____) WARREN. 473. LUCINDA, b. (_____); m. JACOB KNAPP. 474. POLITE, b. (_____); m. JOHN HEWLETT. 475. CECELIA, b. (_____); m. CYRUS JACKSON. 476. VIOLETTA, b. (_____); m. DANIEL FOOTE. 479. JAMES, b. 16 Apr. 1762; d.30 Feb. 1778. 480. ABIGAIL, b. 4 May 1764; m. WILLIAM JERNEGAN (18). 481. HEBRON, b.16 Feb. 1767. 482. WILLIAM, b. 30 July 1769. 483. SUSANNA, b. 22 Dec. 1771; m. RANSOM NORTON (570). 484. MARY, b. 10 Mch. 1774; m. SARSON CHASE (226). 485. NATHAN, b. 23 Dec. 1778. 486. LUCIA, b. 18 Dec.1782, m. FRANCIS REMICK. 487. ELIZABETH, b. 2 July 1785; m. SAMUEL PRESCOTT. 488. CLARINDA, b. 29 July 1787; m. NATHAN ARMSBY. 489. JAMES, b. 16 Oct. 1789; m. ALMIRA ALLEN. 490. ANDREW BOARDMAN, b. 9 Sept. 1791; m. POLLY HIGGINS. 491. MARTHA, b.21 Sept. 1775; m. HARDY E. HITCH. 492. WILLIAM BRANDON, b. 17 Dec. 1777; m. PRUDENCE ALLEN (276) 6 Nov.1800. 493. ELIZABETH, b. 5 Feb. 1781. 500. REBECCA, b.18 June 1795; m. MOSES MAYHEW (426). 501. JONATHAN, b.7 Apr. 1797; m. ALMIRA BUTLER . 502. GILBERT, b.25 Aug. 1800; m. CATHERINE TILTON. 520. DAVIS, b.24 Oct. 1782. 521. JAMES, b. 23 July 1785. 550. GEORGE, b. (1777); d.y. 551. GEORGE, b. 11 Mch. 1782; m. (1) CLARISSA MAYHEW (652) and (2) MEHITABLE MAYHEW (645). 552. ELIZABETH, b. 15 Nov.1784; m. BENJAMIN SKIFF (152). 560. LYDIA, b. 20 Oct. 1764; m. BENJAMIN MAYHEW (300). 561. NATHAN, b. 15 Feb. 1766; d. 26 July 1800. Master mariner. 562. ELIJAH, b.10 Jan. 1769. 563. RUHAMAH, b. 6 Sept. 1772; m. BENJAMIN SMITH (160). 564. SETH, b.14 Apr.1775; m. ELIZABETH COTTLE. 565. MERCY, b.1 Apr.1781; m. EPHRAIM SMITH (155). 570. MATTHEW, b. (1766); m. DRUSILLA DUNHAM (246). 571. ANNA, b. (1767); prob. d.y. 572. JONATHAN, b. (1769); m. JUDITH BROWNELL. 573. NANCY, b. (1771); m. WILLIAM HOWLAND. 574. MARY, b. (1775); m. (1) WILLIAM DUNHAM and (2) MATTHEW TILTON (92) Apr. 1806. 575. SUSANNA, b. (1776); prob. d.y. 576. DEBORAH, b. (1778); d.y. 577. DEBORAH, b. 25 Aug. 1781 ; m. EBENEZER VOSE SOULE. 578. THOMAS WHITE, b. 5 Sept. 1795; m. BETSEY TRIPP, (res. Wellfleet, Mass.). 577. SUSAN, b. 28 Apr. 1797; m. NATHANIEL HATHAWAY. 580. THADDEUS, b. (_____); m. SUSAN _____. 583. ELIZABETH, b. 1784; d. 20 July 1819 unm. 585. FEAR, b. (_____); m. ADAMS. I. BENJAMIN, b. 1846, m. HARRIET W. WEST. They had three children, Cora, Ernest C., and Benjamin Carleton whose son Benjamin Carleton Mayhew, Jr. was elected representative to the General Court from Dukes County in 1966. II. JARED, b. 1852, m. JERUSHA A. REED. They had one dau. Ethel L.
591. LYDIA, b. 16 Nov.1787; m. RUFUS SMITH. 592. ELIJAH, b. 26 Jan. 1790; m. MARTHA SMITH. No issue. 593. HARIPH, b. 6 Nov.1791; m. SALLY SMITH. I. BARTLETT, b. 1829, m. ABBIE A. LUCE. II. DAVID, b. 1834, m. ARABELLA COTTLE. Their children were Bartlett, Bernice E., Vesta W., and Clyde R.
595. SARAH, b. 28 Dec. 1795; m. WARREN BULLEN. 596. RUBY, b. 19 June 1799; d. Oct. 1876; unm. 597. LOVEY, b. 27 Apr. 1802; d. unm. 598. ALFRED, b. 31 Jan. 1804; d. Aug. 1887, unm. 599. JARED, b. 19 May 1807; m. EMMA M. NORTON. 600. SALLY, b. 28 June 1767; m. HENRY HILLMAN (173) 9 Dec. 1790. 601. FRANCIS, b. (1769); m. SUSAN SMITH (151) 11 Dec. 1788. 602. THANKFUL, b. 21 Dec. 1770; m. PRINCE BAKER 24 Oct. 1803. 603. DEBORAH, b. (1773); m. ABEL BAKER 1795. 604. EPHRAIM, b. 19 Mch. 1778; m. SUSANNA PEASE. 606. JEDIDAH, b. 7 Sept. 1782; m. JOSEPH MAYHEW. 607. WILLIAM, b. It Dec. 1784; d. umn. 608. TRISTRAM, b. 23 Dec. 1786; d. unm. Liverpool 1810. 609. SMITH, b. 23 Sept. 1788; m. THANKFUL COTTLE. 610. HILLIARD, b. 19 Mch. 1791; d. unm. 1817. I. HEPSIBAH FRANCES, b. 1820, m. JAMES COFREN. II. DAVID WILLIAM, b. 1825, m. ABBIE A. (Luce) MAYHEW, wid. of REV. BARTLETT MAYHEW. 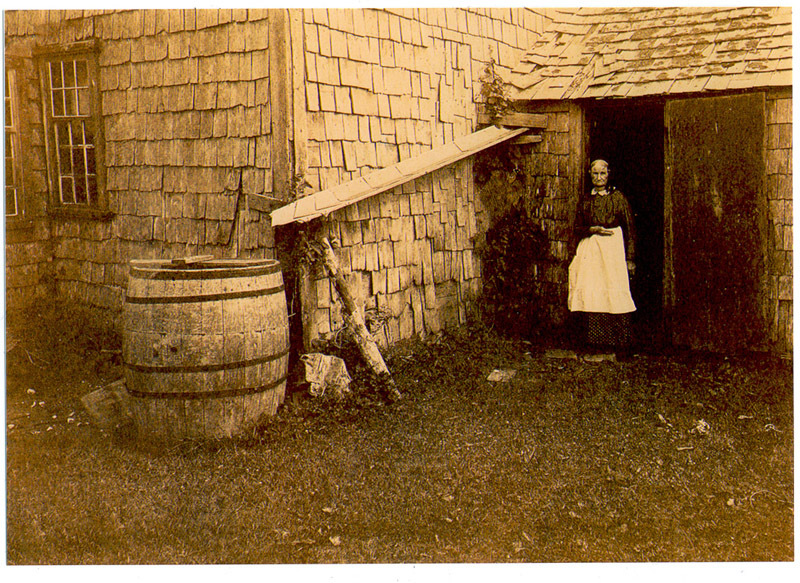 Their children born in W. Tisbury: Jerry B., Georgene O., Adelaide S., Stella G., William A. (d.y. ), William A., Alice T., and Flavel S. (d.y.). 612. HANNAH, b. 7 July 1794; m. STEPHEN WILLIAMSON; d. 7 Aug. 1818. 613. PHILIP, b. 13 July 1797; m. PHEBE BURTON. 315. TIMOTHY MAYHEW , (Timothy,9 Simon,8 John,7 Thomas,6-5 Matthew4), b. 20 May 1743; res. C., farmer; m. RUTH DAVIS MAYHEW (274) in 1768, who was b. 17 May 1746. 620. (Child), b. 9 Mch. 1770; d.9 July 1771. 621. JOHN, b.8 Dec. 1772. 622. MELATIAH, b.4 Dec. 1774; m. LUCY LOOK (181) 16 May 1805. 623. JANE, b.25 Oct. 1779; d.1849. 624. LYDIA, b. 11 Sept. 1781; d.1849. 625. TIMOTHY, b. 1 Oct.1785; d.18 Dec.1846. 626. DAVIS b. 20 Aug.1788; m. CYNTHIA GRINNELL. 630. JOSEPH, b. (_____); m. POLLY COTTLE 23 Oct.1796. 631. LOVE, b&SHY; (_____); m. LEMUEL HARDING. 632. RACHEL, b&SHY; (_____) ; m. BENJAMIN WATCH. 640. ABNER, b. 11 July 1776; m. EUNICE SMITH (176) 5 Nov.1807. 641. JOSEPH, b. 7 Feb. 1778; m. JEDIDAH MAYHEW. 642. MARTHA, b. 13 Muy 1781; m. (1) DAVID MAYHEW [605? ]; (2) SAMDEL BLACKWELL. 643. FREDERICK, b. (_____); m. ZELINDA TILTON. 645. MEHITABLE, b.11 Aug.1786; m. GEORGE MAYHEW (551). 650. JAMES, b. (_____); m. DEBORAH MAYHEW. 651. PERSIS, b. (_____); m. PAINE TILTON. 652. CLARISSA, b. (_____); m. GEORGE MAYHEW (551). 351. WILLIAM MAYHEW , (Matthew,10 Micajah,9 Matthew,8-7 Thomas,6-5 Matthew4), b. 30 Oct. 1784; res. E., trader. Me lived on the home lot of Gov. Mayhew as representative of the eldest line in his lifetime. For many years he was deacon of the church in E., and was one of the prominent citizens of the town during his long and useful life. He was married three times; (1) LUCY MAYHEW (231) 31 Dec. 1772, who was b. 25 April 1753 and d. bef. 1798 (2) Mrs. JANE (Kelley) (50) PEASE, wid. of Ephraim, 8 April 1798, who was b. abt. 1745 and d. 16 Oct. 1816; (3) PARNELL MAYHEW (421), who was b. 23 Sept. 1785 and d. 26 Oct. 1848. He d. 11 Dec. 1840 and his will 30 April 1829 was pro. 18 Jan. 1841. 655. PHEBE, b. 16 Sept. 1775; m. WILLIAM MAYHEW (482). 656. LUCY, b. 29 July 1778; d. 4 Mch. 1794. 657. WILLIAM MANNING, b. 11 Mch. 1781; d. 7 Sept. 1800. 658. THOMAS, b. 4 Sept. 1784; m. (1)MARGARET LATHAM; (2) JEDIDAH CLEVELAND. 659. JONATHAN, b. 11 June 1787; m. ELIZABETH COOKE (40) 20 Oct. 1816. 660. JOSEPH, b. 30 Sept. 1791 ; m. NANCY WORTH. 662. REBECCA, b. 9 July 1797; m. Rev. SHIPLEY WELLS WILSON. 663. HANNAH KELLEY, b. 25 Jan. 1799; m. THOMAS WORTH. 664. WILLIAM MANNING, b. 19 Sept. 1800. 665. ELIZA ANN, b. 11 Apr. 1804; m. CYRUS B. WORTH. 666. EPHRAIM PEASE, b. 3 Aug. 1806. 671. JOHN BURROUGHS, b. Mch. 1790; m. DEBORAH HERSEY 25 Apr. 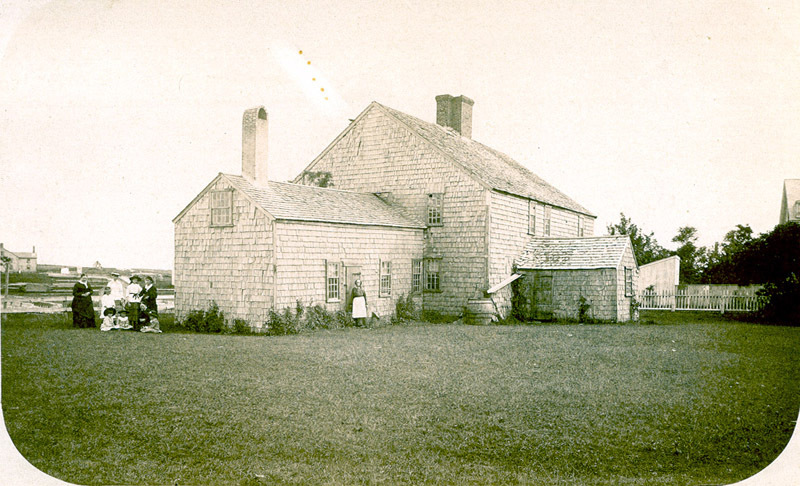 1811 and settled at Hingham, Mass. where he followed trade of sailmaker. He d. 14 Apr. 1848 leaving issue, a son John Matthew, b. 23 Oct. 1815. 674. SARAH; m. WILLIAM COFFIN (175). 675. ELIZA; m. AARON SOUTHER. 677. MARGARET; m. PETER MARTIN COFFIN. 681. THOMAS MANNING, b. (_____). 682. HARRIET BYRON; m. JAMES BILBO. 683. ANN FRANCES; m. Dr. ALEXANDER CUNNINGAHAM. 690. HOMES, b.24 Aug. 1787; m. LUCRETIA WOODWARD. 691. MELVIN, b.15 Dec. 1790; m. LUCY WEBSTER. 692. TRUMAN FOSTER, b.5 Dec. 1793. 694. THOMAS LOTHROP, b.1 Nov.1798. I. EVELYN HILLMAN, m. JAMES ADAMS. II. HAROLD B., m. ELIZABETH KELLEY; res. Maryland. III. EMMA VINCENT, m. JOHNSON WHITING 10 Sept. 1901, and has issue: John W. M. (Whiting), b.12 June 1908, and Everett Davis (Whiting) 19 Sept. 1915. IV. INEZ PARNEL, m. ERNEST MAYHEW. V. CLARA WARREN, m. WARREN COLE; res. Maryland. VI. JOHN WESLEY, m. HELEN LEE; res., Indo&SHY;China. 800. HEBRON, b. 5 July 1793; m. ABIGAIL CRAIG. 801. NATHAN, b. 9 Oct. 1795; m. ELIZABETH ATHEARN. Nathan Mayhew removed to Farmington, Maine, with his parents. Returned to Martha's Vineyard and married Elizabeth Athearn. Nathan, his wife Elizabeth, and two children - Caroline E. Mayhew and Nathan Gould Mayhew - are buried at Milton Cemetery, Milton, Mass. 802. MIRA, b. 9 Apr. 1798; m. DAVID WENTWORTH. 803. HOLMES, b. 10 Sept. 1800; m. (1) MERON G. GAY; (2) Mrs. RACHEL (Pease) NORTON; (3) HELEN BOYD. 804. THADDEUS, b. 4 June 1803; m. PAULINE HERSEY. 805. ELIZABETH, b. 24 Sept. 1805; d. 24 Feb. 1824. I. SUSAN M., b. 3 Nov. 1795; m. HARRISON P. MAYHEW (407) 14 Dec. 1820. Grandparents of William and Annie Mayhew of Edgartown. Died 15 June, 1885. II. WILLIAM, b. 13 Mch. 1798; m. CAROLINE MAYHEW (_____) 14 Aug. 1834; res. Edgartown. No issue. Died 10 Nov. 1855. III. LUCY, b. 25 Oct. 1800; m. CHARLES G. NORTON (_____) 15 Apr. 1828. No issue. Died 19 Jan. 1832. IV. BARTLETT, b. 22 Oct. 1803; m. MARY C. ATHEARN (146) 14 July l829. Father of William Bartlett, Jonathan, Lucy and Mercy. Died in California 3 Sept. 1877 at home of sons and left many descendants there. V. PHEBE, b. 15 Aug. 1806; m. DAVID ADAMS (81) 29 June 1826. Died 22 Mch. 1862. VI. JANE KELLEY, b. 30 Jan. 1809; m. (1) SANDERSON MANTER 27 Nov. 1834. No issue. (2) DANIEL FLANDERS March 1813. Died 30 Nov. 1893. VII. JAMES, b. 4 Oct. 1811; m. CAIIOLINE E. COTTLE 16 Jllly 1835. Died 24 July 1882. No issue. VIII. NATHAN, b. 24 July 1814; m. (1) REBECCA SMITH 4 Apr. 1839 and had issue: Sanderson, Ulysses and Mrs. Jane Kelley (Smith) all now living in W. T. (1925); (2) ELIZA C. BARTLETT 25 Jan. 1877. (Descendants reside in Ohio). Died 25 Jan. 1907. X. JONATHAN, b. 15 Sept. 1819; m. (1) JANE S. POOLE 6 June 1842; (2) CHARLOTTE AMELIA CATHCART 25 Dec. 1853; [*She died on her passage to California 28 Oct. 1857, aged 30 years and was buried at sea.] (3) AMELIA EVERETT in California. Died 2 Apr. 1886 in California, where descendants now live. 812. CLARINDA, b.12 Aug.1791; m. WINBORN A. SWETT. 814. DEBORAH, b. 23 June 1795; m. STEPHEN HOWE. 815. EPHRAIM, b.11 Sept. 1797; m. ABIGAIL BULLEN. 816. HENRY, b.1 Nov.1799; m. MARY CUSHING. 817. BENJAMIN, b.10 Dec. 1801; m. SOPHIA SMITH. 818. JEDIDAH, b.18 Out. 1804; m. WINBORN A. SWETT. 820. SARAH, b.18 Out. 1808; m. CORNELIUS SMITH. 850. HANNAH, b. 2 June 1798. 851. ASENATH, b. 27 July 1800. 852. MARY COTTLE, b. 3 Feb. 1803. 853. ANGELINA, b.17 July 1805. 854. REBECCA, b. 3 Aug.1807. 855. EDWIN, b. 6 Mch. 1812. [Lew Mayhew <lmayhew@ainet.com> writes: "My grand father was Herman Mayhew of southern Ohio, and southern Illinois. I believe his father was a Lewis L. or Lewis S. Mayhew who I believe was born about 1845 in Lebanon, Ohio. I have a copy of his civil war discharge. Since Lebanon is close to Cincinnati (about 20 miles north) I am wondering if Lewis L. (or S.) is the son of Edwin Mayhew (number 855 in the Charles Banks genealogy of the Martha's Vineyard line. According to Banks Edwin Mayhew's father was Joseph Mayhew (number 630) who if I understand the notation migrated to Cincinnati. Edwin was born on 6 March 1812 and would have been about the right age to be the father of Lewis L (or S) Mayhew born in that area about 1845. Any information regarding this possible connection would be appreciated. Questions? Queries? Looking for a MAYHEW? Post your Martha's Vineyard Mayhew Family questions to the Dukes County Genweb Query Forum. Or, use the Mayhew Genforum for any and all Mayhew Family questions. Do you subscribe to the Mayhew Family mailing list? It's free! MAY-L -- A mailing list for the discussion and sharing of information regarding the MAY surname and variations (e.g., Maye, Mays, Mayes, Mayhew, Mayhue, Mayberry, Mayflower) in any place and at any time. How to Subscribe and Unsubscribe: It's easy -- just click on the link above or send a new email message to MAY-L-request@rootsweb.com. Write just the single word "subscribe" in the body of the message. That's all! If you want to unsubscribe from the list, click on it and write just the single word "unsubscribe" in the body of the message.